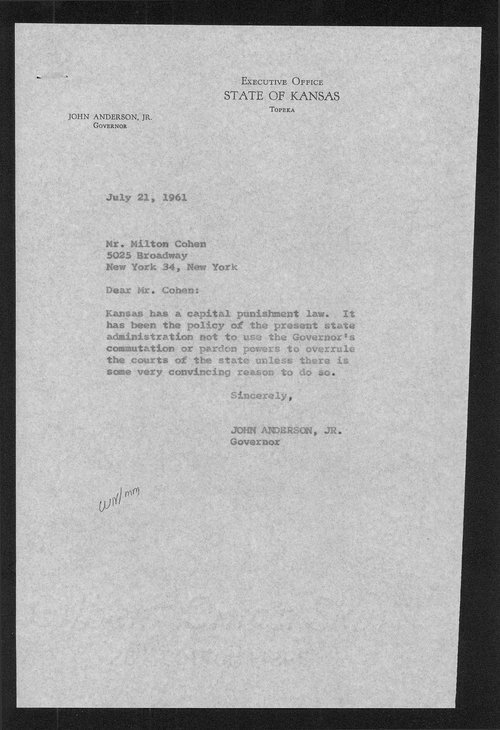 Republican politician John Anderson compiled this series of correspondence on capital punishment issues from letters received while governor of Kansas from 1961-1965. The State of Kansas executed fifteen men between 1944 and 1965. Two AWOL soldiers, George York and James Latham, who were hung on June 22, 1965, became the last persons executed before the Supreme Court ruling of 1972 invalidated Kansas' death penalty. In 1976, the U. S. Supreme Court's Gregg vs. Georgia decision allowed states to pass new death penalty laws if they followed certain guidelines, and after much debate, this eventually led to the passage of the 1994 law which permits execution by lethal injection, which Governor Finney refused to sign. That death penalty law was rejected by the Kansas Supreme Court, but then upheld in 2006 by a five to four vote of the U. S. Supreme Court. Although eleven men have received the death sentence since the new law was passed (1994), none have been executed.